Zome Design allows your company or organization the ability to have your own free online store without any of the hassles of creating an e-commerce website. It is a completely managed solution: No hosting fees, server or web site maintenance, merchant or credit card processing fees. We design, develop, add/modify/remove products and can even help take your pictures. We have built our online storefronts from the ground up specifically for selling custom t-shirts and other screen printed and embroidered merchandise such as polos, caps, bags and more. These are not cheap iron on or digital transfers; this is high quality screen printing, embroidery and tackle-twill like you would see in a retail store. We have in house designers, programmers and data coordinators to help you manage your store. Everything from adding and removing products to developing new features and marketing tools to help you succeed. Having a Zome Design E-Store allows your organization to have one central place to order all of your merchandise. Locations in other cities don't have to find their own vendors to fulfill their needs. Reduce time and save money by ordering in bulk from one company. This also helps maintain your brand and keeps everything consistent whether you have one location or one hundred. Each E-Store is assigned an account manager to personally work with you to make sure you receive a personal touch and that your needs are always taken care of. Never again worry about passing out flyers, counting sizes or collecting money. The online store takes care of all that. Just e-mail out a quick link or post it to your company intranet site and let the users sign up themselves. Commission Formula: offers a 20% commission which allows your organization to make money but also keeps the cost of the merchandise affordable. This is our #1 selling option and is great for schools and other non-profits. Lowest Price Formula: offers no commission back and it offers the lowest priced apparel possible. This is great for businesses such as banks that have multiple branch locations that do no wish to make money from their employees, but would like to have one central place to order their merchandise. We handle all payment processing. Credit Cards: accept Visa, Mastercard, Discover and American Express without the hassles of payment gateways, and all the monthly and per transaction fees normally associated with that. Employee Payroll Deductions: offer your employees the ability to have the order taken out of their next 1, 2, or 3 paychecks. The employee puts in their employee ID number and we invoice the company. Gift Certificates: gift certificates can be purchased in bulk by the company in advance through your account manager or you can visit the e-store and purchase one at a time. Different amounts are offered and you can have us e-mail a pdf of the gift certificate to you or directly to the recipient. The gift certificate will contain your company's logo on it as well. Promotional Codes: we offer a variety of promotional code options for your convenience. Purchase Orders: users can enter new or pre-defined PO numbers for an order. We'll then bill the organization. We also can add a GL code to make it easy to see which branch or location the order is from. If you need more control, we have the ability to allow you to approve orders before they are processed. Access sales, production and commissions data in real time. Custom images, links and background colors available to match your brand or web site. You can also give us a welcome paragraph for the home page. We are the only online store that allows you to offer all three options of screen print, embroidery and tackle-twill (applique) merchandise on demand. This is not digital printing or vinyl. Although we can offer that if you desire. Offer multiple logos as well as the option to personalize the text below the logo. This is great for organizations with different departments. It's also great for schools that may want to offer custom names on the back of their sweatshirts. No Minimum order & No Inventory. 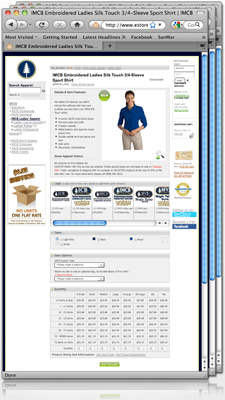 Offer 100+ apparel products with no upfront inventory. Each item is custom produced and drop shipped as it is ordered so you never have to worry about any out of pocket expenses or acquiring any unneeded items. Promotional products and specialty advertising merchandise also available for order and fulfillment. Shipped: orders under 5lbs are shipped USPS Priority Mail (1-3 days) and orders over 5lbs are shipped UPS Ground (1-6 days). Each order will receive a shipping confirmation e-mail with tracking details. Local Pickup: local organizations in the Spokane, WA area can choose to pickup at our downtown facility to avoid shipping costs. Rep Delivery: select accounts are eligible for bi-weekly or weekly rep delivery based on order volume. We don't leave you empty handed. We can help you design flyers and e-mail campaigns to help promote your online store. We'll even give you a promo code to help kick off your new store. The success of your e-store will truly be dependent on how well you market it to your organization. Groups that market well see great results. If you put up an online store and don't tell anyone about it, you're not going to receive any results. We handle all of the customer service. Customers can e-mail or call and speak with a real human. Never worry about tracking down orders, collecting payment, etc. All of our team members are on site at our corporate offices so you never have to worry about being redirected to an off-site call center. Sales tax is collected on all orders shipped within the state of Washington. If you have ever had to charge sales tax, you know what a pain it can be. We collect and pay all sales taxes to the correct counties based on where your items are shipped. Our sites are expertly engineered to help you rank at the top in search engines. Custom page titles, meta tags, descriptions, alt tags and more. Our developers and search marketing experts are constantly researching and studying the latest trends to help make sure that our stores are more easily found on the internet.